Every natural wants to look summer time fine without the worry of moisture depletion from sun exposure and chlorine. Dryness is the main culprit of most, if not all, hair problems. In order to maintain length and shine, your hair needs moisture. Because coarse, coily textures are more prone to experience dryness, moisture reinforcements are essential. Although naturals rave over co-washing, some of the most praised drug store conditioners are packed with silicones. Yeah, I know the slip feels amazing for now, but the aftermath of product buildup is dryness like no other. If your conditioners don't contain water soluble silicones, it may be time to switch it up. The Bobeam Cheris Hibiscs Moisturizing Shampoo Bar is great for removing excess buildup from your scalp and hair. The sulfate-free cleanser has emollients including coconut oil and shea butter that add moisture and prevent stripping. Most natural coilies look forward to the wash and go season. 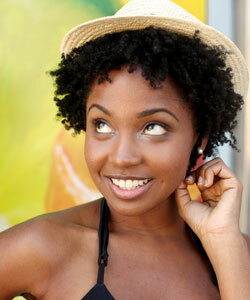 A great way to rock your shrinkage, cut time and increase your hair's moisture is co-washing. The problem is finding the right product that will not strip your coils of much needed moisture, but will still cleanse your coils from dirt and light product buildup. As I Am CoWash Cleansing Conditioner provides a clean wash without the stripping affects of shampoo. Although the product does not contain silicones, you will experience great slip after applying liberal amounts to your strands and detangling with either a wide tooth comb or your fingers. Let the co-wash sit for 3-5 minutes allows it to eliminate scalp debris and product buildup. Leave-in conditioners are a great solution for rejuvinating your coils after the manipulation of the wash process. Because coily hair needs so much moisture, you won't want to skip this step in your routine. Leave-in conditioners help ban frizz and lock in much-needed moisture. Finickey Leave-in Conditioner can help lock in moisture and prepare your hair for styling by increasing manageability and making it easier to detangle. Apply it from root to tip in sections to distribute it evenly. Remember to show any knots extra love to prevent breakage when detangling. Now that you have cleansed and rejuvenated your coils, it's time to style. There are many naturals who enjoy defined, stretched styles to the shrinkage of some wash-and-gos styles but, no one wants to pay for elongation or definition with crunchy hair or dry. How do you get great definition without getting dry, crunchy coils? Not only does Camille Rose Naturals Curlaide Moisture Butter nourish your locks but provides a soft hold for twists and braids. Apply a generous amount on wet hair from root to tip and style as desired. For best results, allow your hair to air dry in order to maintain your hair's ultimate softness. Cleansing and conditioning are important elements in every regimen that produces happy, healthy coils. Wouldn't it be nice if you could get this recipe for happy moisture locked coils wrapped up nicely in a brown paper package or two? Well, we can't promise the brown paper part, but now the Coily Detangling Kit and Detangling Summer Coils Kit are right at your fingertips in CurlMart. Even though it's July, summer will become progressively hotter as August and September roll around. Don't allow the combination of high temperatures, high humidity and high dew points hair to rob your hair dry. 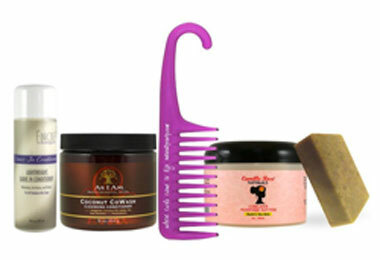 Grab a coily kit from CurlMart and enhance your hair regimen today!